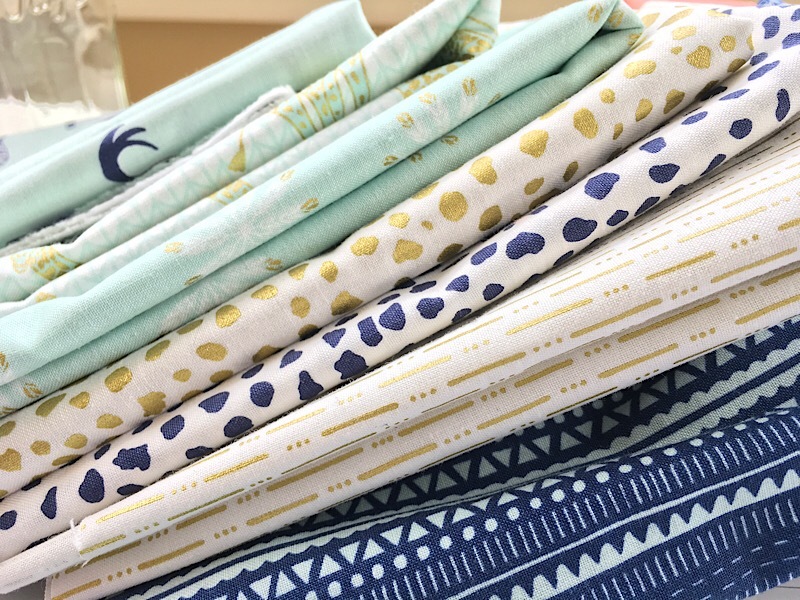 This week, I decided I simply could no longer resist Melissa Mortenson’s newest fabric line, Safari Party. I’ve had these fun fabrics on my desk for awhile now, and every day they have been calling my name. At last, it was time! I couldn’t take the temptation any longer, so I quickly reworked my schedule and hit the cutting mat. I mean, just look at the gold sparkle! And those spots! The mint color with the navy is absolute perfection, in my humble option. 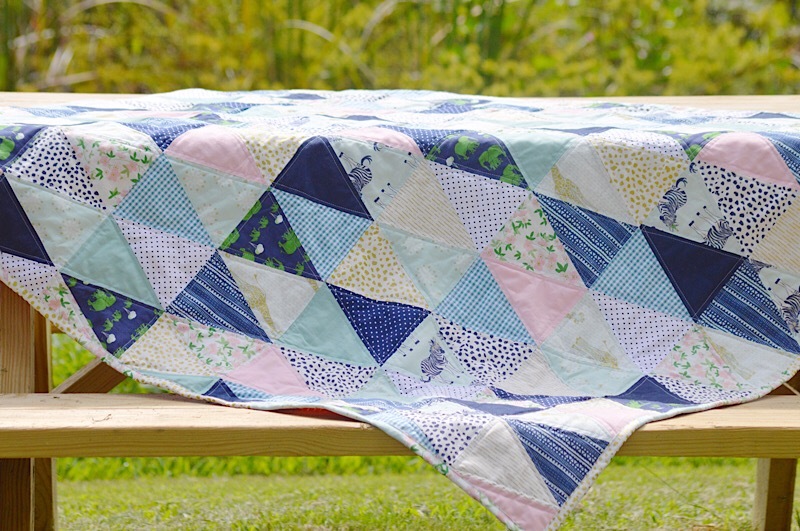 I used the Baby Geo pattern, which is a FREE downloadable pattern available on the Riley Blake Designs website. Click HERE for the pattern. 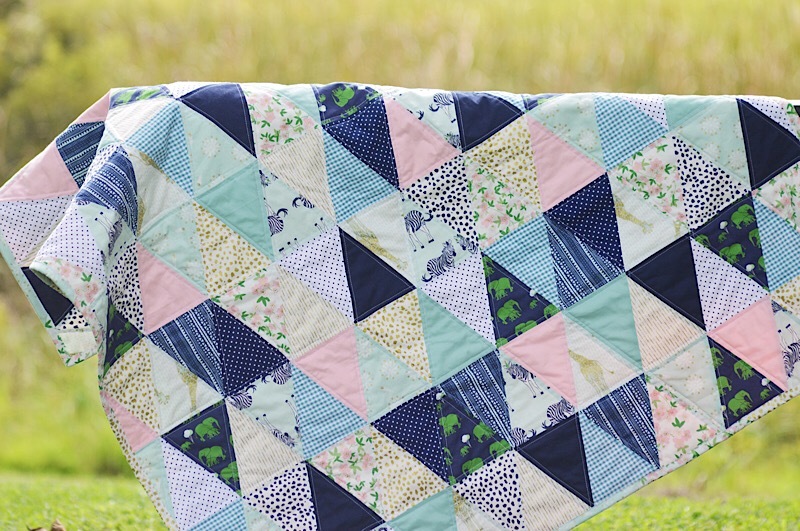 I love this baby quilt because it doesn’t take much in the way of advanced planning and its clean geometric design looks very fresh and modern. Sewing this was very straightforward. 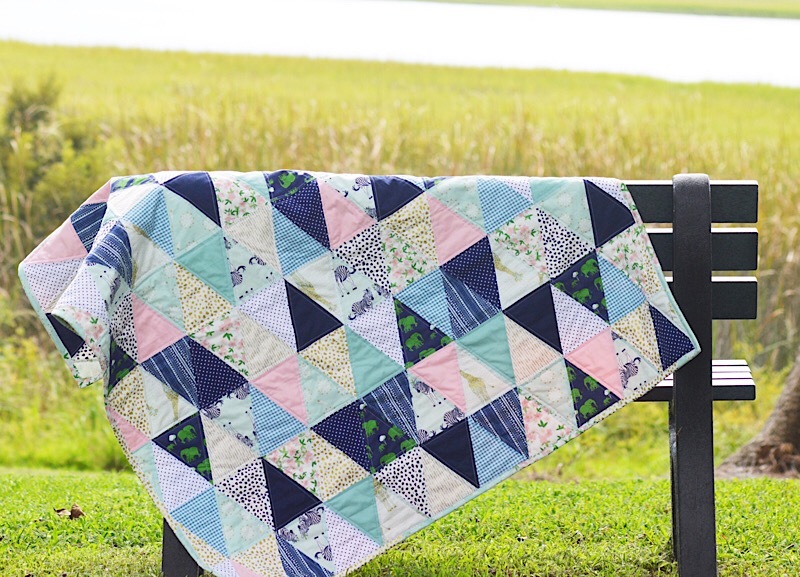 Sew the triangles together in rows. Press. Repeat. Then sew the rows together. After your quilt top is assembled, you make your quilt sandwich (quilt back + batting + quilt top) and baste. 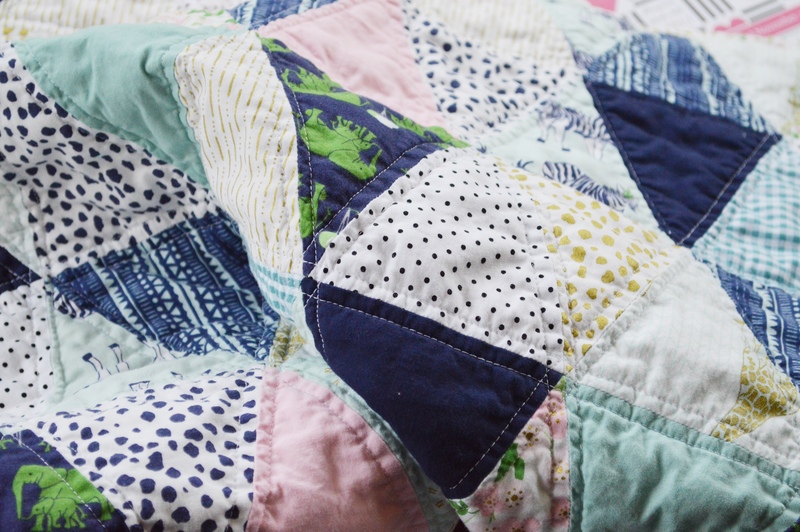 After you have finished basting the quilt, you are ready to quilt it. 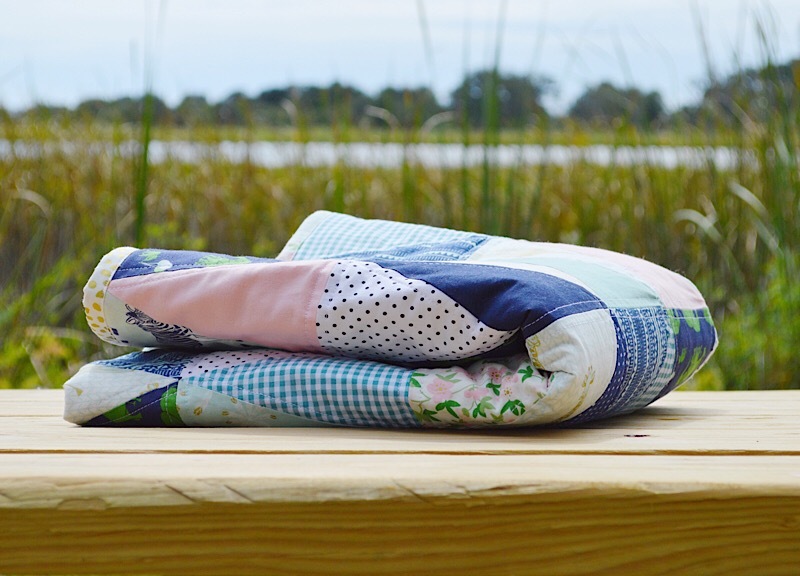 You can either take it to be professionally quilted, or you can quilt it at home by hand or by machine. 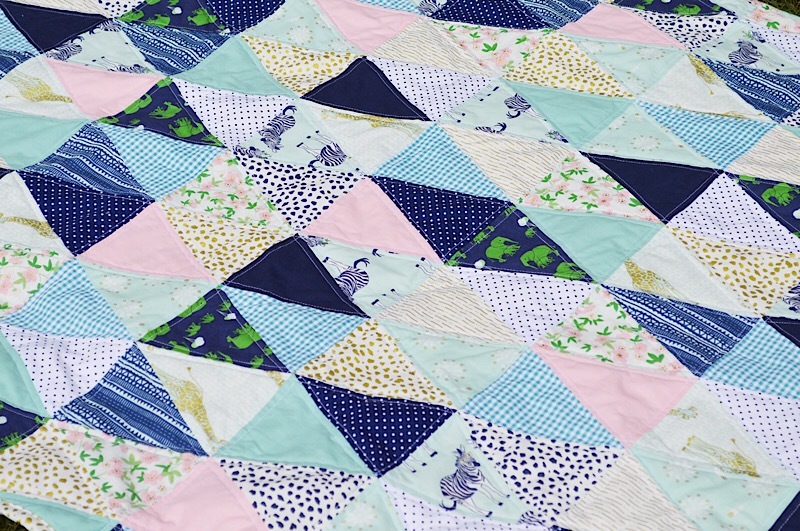 In the interest of time, I machine quilted this by stitching 1/4″ on either side of the diagonal and horizontal seams. 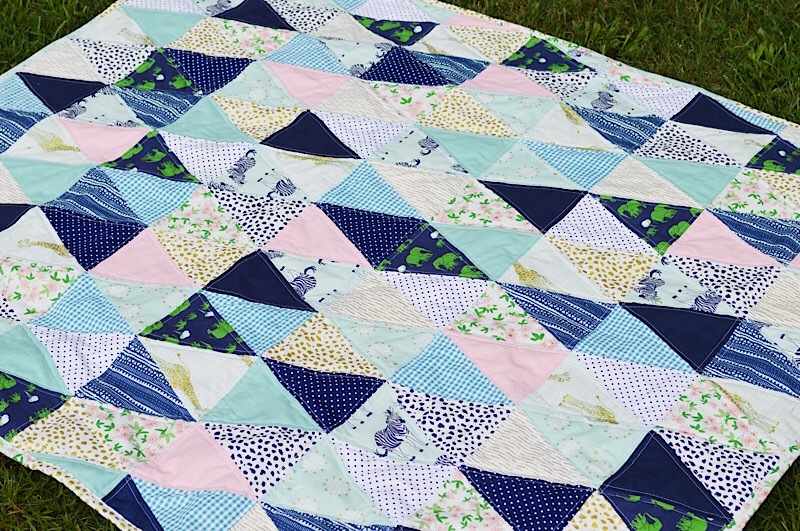 *Tip for quilting at home: I strongly recommend using a walking foot. This funny looking presser foot feeds the top and bottom fabrics through at the same time, which greatly reduces puckering and stretching of the fabric. In addition to Melissa Mortenson’s Safari Party fabrics, I added a few Riley Blake Designs Basics. 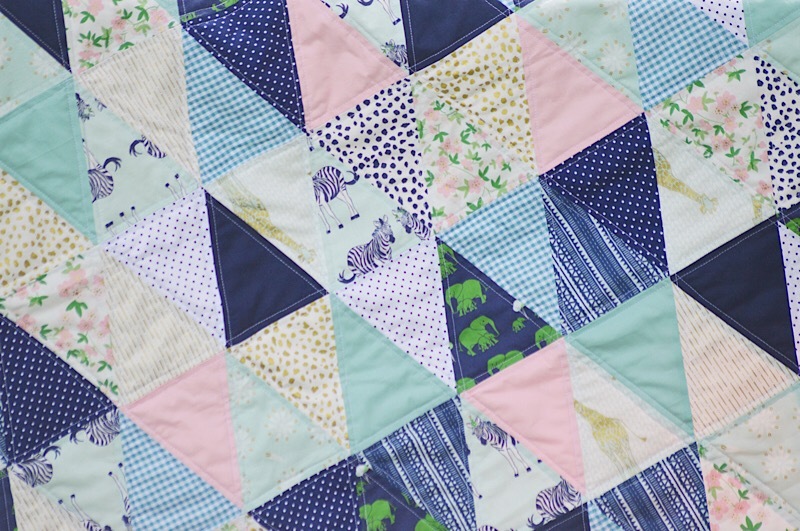 On the quilt front, I used Confetti Cottons in Riley Navy, Sea Foam and Riley Baby Pink. I also used 1/8″ Teal Gingham and Navy Swiss Dot. For the quilt back, I used Coral Swiss Dot. 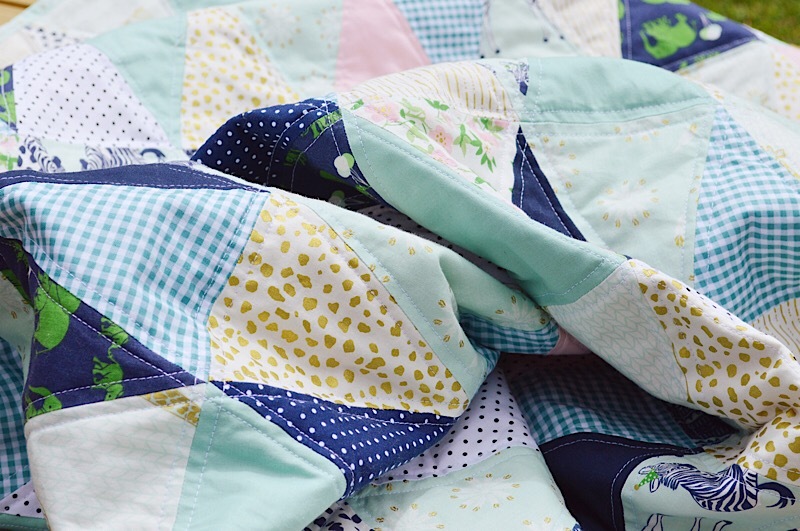 Here is a peek at the quilt back. You can see the gorgeous Coral Swiss Dot. Because it wasn’t quite wide enough, I used scraps to finish it off. I also used scraps for the binding. 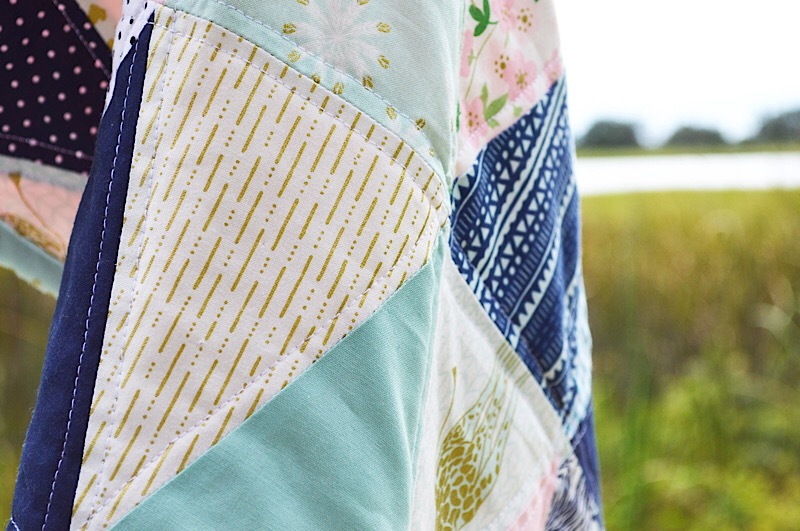 HERE is a quick and easy machine binding tutorial. 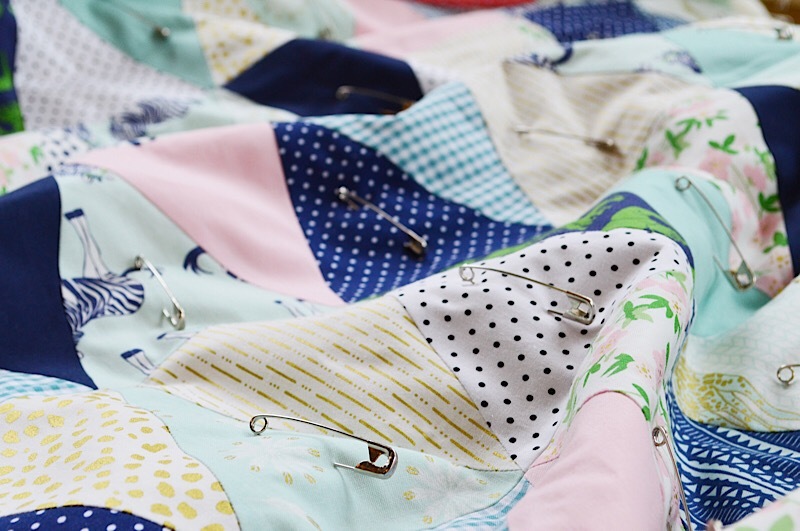 My absolute FAVORITE part of making a quilt is throwing into the washer and dryer to get that soft and cuddly “crinkled” look. Also notice the scrappy binding. I love scrappy bindings not only for the charming homespun look they give, but also because they allow me to use up every last bit of pretty fabric. Here is a look at the front after it has been washed and dried. The trick to getting a nice crinkled look is to NOT pre-wash your fabric. Cotton will naturally shrink a little, so the process of washing and drying will cause the fabric to shrink a bit, creating the crinkle. 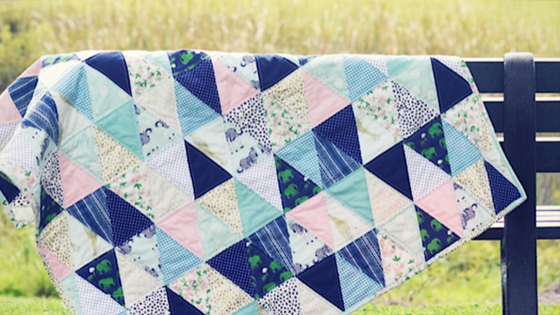 This will become more pronounced each time you wash and dry, until your quilt finally settles into it’s soft, huggable state of perfection. 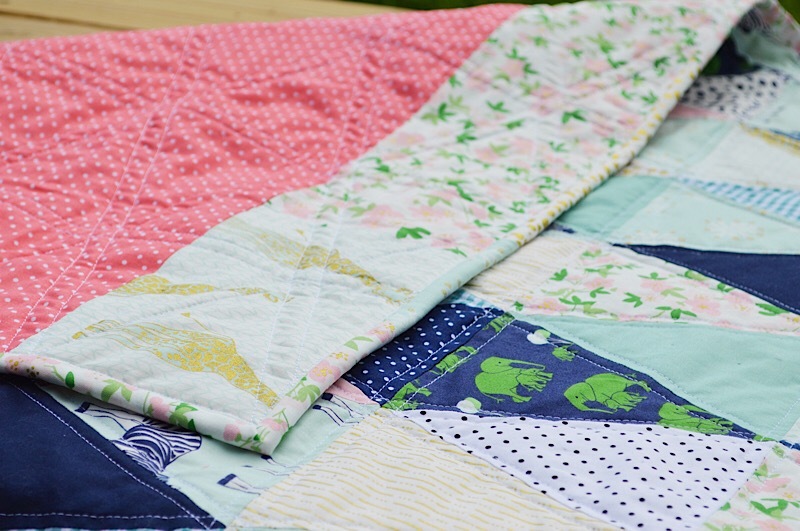 Once you have a hang of this quilt design, you can easily make it larger or smaller, according to your needs. 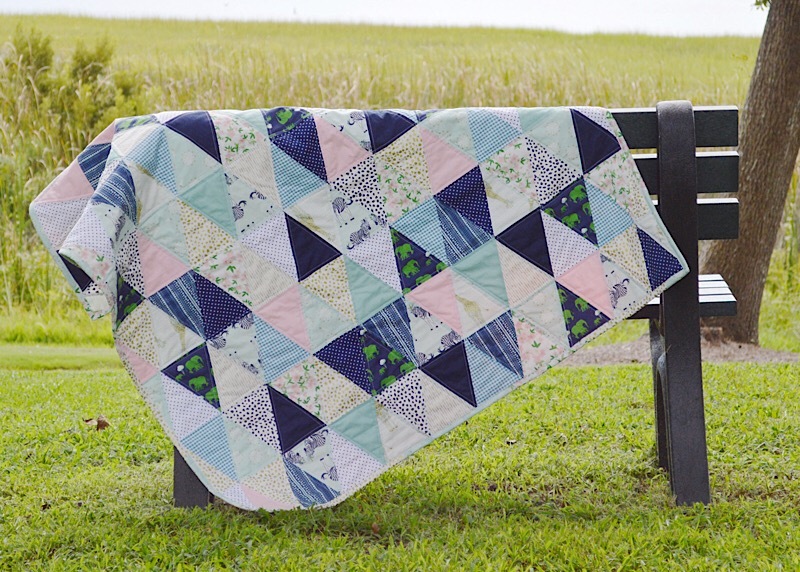 You can find the FREE Baby Geo quilt pattern HERE. 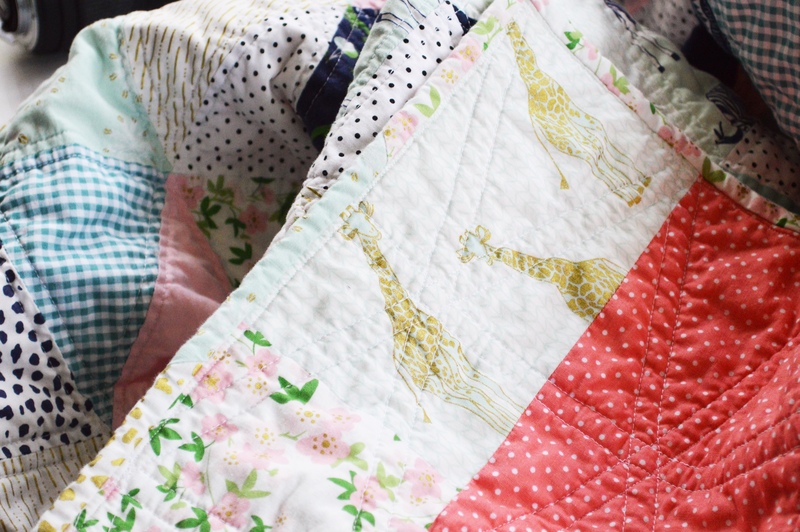 Be sure to share your finished Baby Geo quilts made with Riley Blake Designs fabric on Instagram using #rileyblakedesigns. 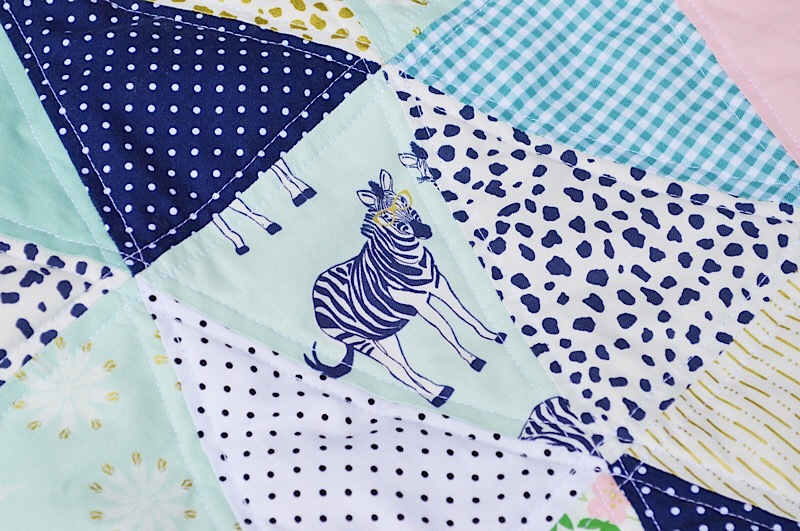 You can view Melissa Mortenson’s Safari Party fabric line HERE.